The arms are those of John George, 4th Baron Monson (1785-1809), who married Sarah, daughter of 2nd Earl Mexborough in 1807. Besides the present pair, there are only five known examples of this ewer design, all of which are marked by Holland and dated 1807. All have the distinctive male caryatid handle, female mask below the spout, and classical frieze at the shoulder. The example made for the Duke of York, second son of George III and the most important silver collector of his day, was embellished with battle scenes by Edward Farrell in 1823 (and presumably lost the shoulder frieze at that time). 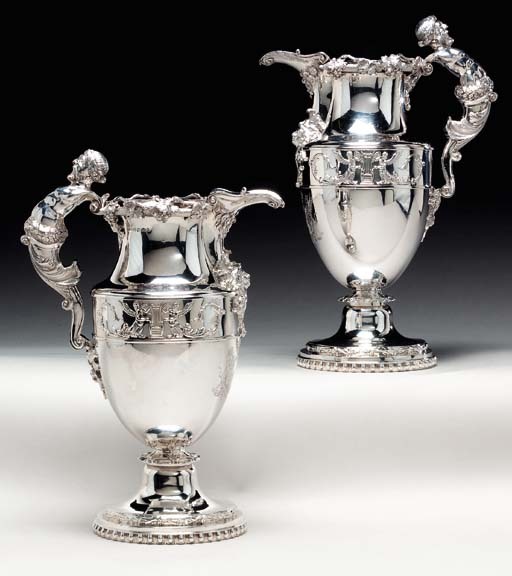 For a list of all known Holland ewers and further discussion of the Duke of York's example see A. Phillips and J. Sloane, Antiquity Revisited: English and French silver-gilt from the Collection of Audrey Love, 1997, no. 15, pp. 72-74.